The Enigma Variations (or "Variations on an Original Theme" Op. 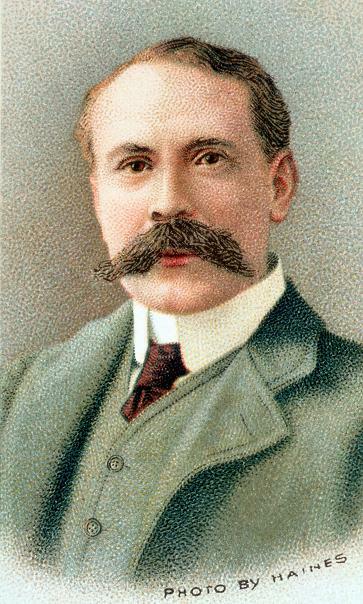 36) is one of the most popular orchestral pieces by the English composer Edward Elgar. It is also a very personal piece of music by the composer and he uses each variation to musically describe the personality of one of his friends and acquaintances. Some of the people depicted were only identified by initials or other clues in the score, but their identities are now known. However Elgar said there was another mystery hidden in the music which is why it is called The Enigma Variations. "Nimrod" is the nickname of A. J. Jaeger, a music editor and publisher who was also a very close friend of Elgar, and this movement is the most deeply felt variation of the whole set. The Nimrod Variation is often played on its own and, because it is slow and deeply emotional, it is often played at funerals and memorial services. Indeed an organ arrangement of Nimrod was recently played during the funeral of Pat Butcher, a character in the British Soap Opera "Eastenders". You can download the piano sheet music, midi and mp3 files using the links on the left hand menu. Below is a video of this arrangement being played by Jim Paterson. Below that you can play the mp3 file or view the sheet music. Here is a link to our own Organ arrangement of Nimrod.